sling is a true joy with many wonderful benefits for your family. healthy hip development and giving your child all important ‘tummy time’. This can be caused by children spending too much time lying on their backs. Time spent in a woven sling, rather than in a pram or on a mat, can help guard against this. When holding your child in the ‘M’ shape, where their knees are higher than their bottom, you are supporting their natural position. This comfy position is easily achieved when using an ergonomic carrier and, as acknowledged by the International Hip Dysplasia Institute, it can promote healthy hip development in children. When your little one upright in a sling this has the same effect on a baby's muscles as 'tummy time', as it helps them to develop their core strength. This is essential for their physical development, from holding their heads up to crawling and walking. fosters a relaxed environment which has been shown to be optimal for learning. By holding your little one close you are able to react quickly to their cues, enabling them to experience new things while feeling secure and calm. Research has proven that babies develop best when they feel relaxed and safe during these early months. The ability to easily talk to your child can have an significant impact on their mental and emotional development, as well as on their communications skills. 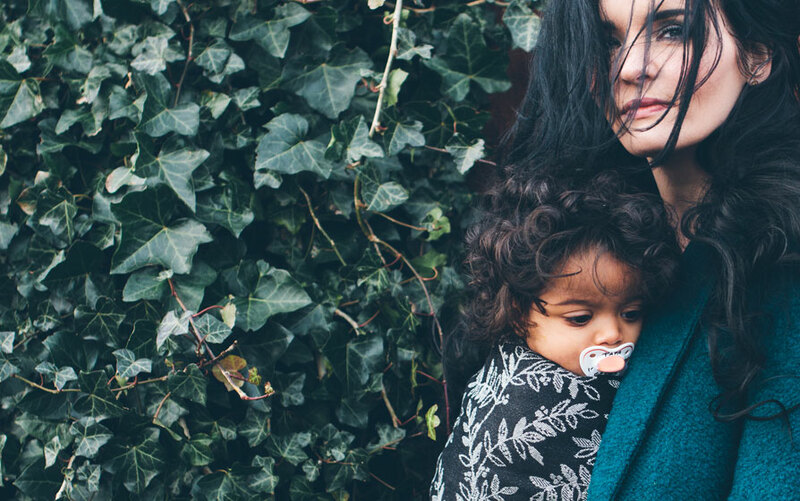 While the release of oxytocin in parents and babies, facilitate by holding children close, can have strong emotional benefits for you both, especially in parents suffering from postnatal depression. Oxytocin is important in creating secure and lasting attachments between parent and child. Whether at home or out and about, using a baby sling gives you a hands-free way of caring for little ones. Babies in a sling are in a state of ‘quiet alertness’ which has been shown to be optimal for learning. They are at the right height to experience the world along with you; seeing and hearing everything that you are doing, listening to you talk and being able to easily interact. shown to help little ones better regulate their body temperature and to lead to less crying. Baby-carrying has also been proven to reduce colic and reflux symptoms and to help with digestion. Holding your baby where they can hear your heartbeat is reassuring and calming for them, especially in the early months, as it mimics being in the womb. Research shows that babies carried for only 1 or 2 hours a day cry 43% less overall, and 54% less in the evening hours. The upright ‘M’ position, supported by ergonomic carriers, can help alleviate the symptoms of colicky babies and those with reflux. Soothing babies with reflux and colic in arms can become tiring very quickly and slings can provide a welcome respite for your arms. The tummy to tummy contact while being carried, gently massages the baby’s abdomen, which can also help with digestion, trapped wind and constipation. bonding, relaxation and can also be helpful for reducing symptoms of postnatal depression. Holding your child against your bare skin helps them to regulate their temperature, heart rate and breathing rates. It also produces oxytocin in the parent and baby, calming both and promoting bonding. 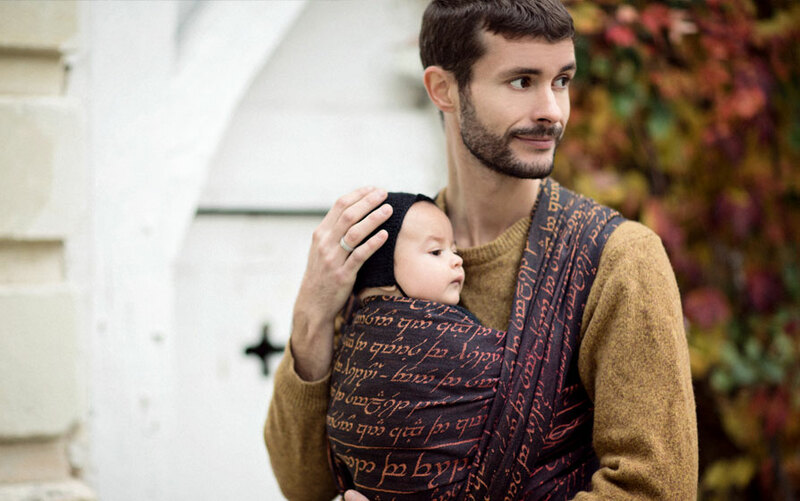 Woven slings make skin-to-skin time easy and the beauty of carrying is dads can do it too. Using a baby carrier can have a huge impact on breastfeeding mothers; allowing you to quickly respond to feeding cues, nurse with confidence on the go and it can help you to breastfeed for longer. Carrying your child close has the added benefit of stimulating milk production in mothers. Why Choose an Oscha Sling? Choosing to use an ergonomic carrier, such as Oscha’s woven wraps, ring slings and structured baby carriers, means you can get out and about in comfort while you enjoy the many proven benefits baby-carrying brings to both you and your child. Designed and ethically handcrafted in Scotland, here at Oscha we are passionate about creating beautiful and practical baby carriers. Lightweight and compact our slings offer the utmost in comfort meaning you can carry for longer and explore more, whether it’s getting on the bus or hiking cross country. Using a sling allows you to navigate your day with ease keeping hands free for older children, or daily chores. Made with parents and little ones in mind, Oscha’s eco-friendly and sustainably produced woven wraps, ring slings and baby carriers are infinitely adjustable so all carers can comfortably share the same sling. Oscha’s Scottish-made carriers bring colour and style to your baby-carrying journey. With patterns and colourways designed in-house, we are constantly looking to innovate and push the boundaries of woven technique. All of our products are ethically made in the British Isles from the highest quality yarns, we believe in sourcing responsibly and produce our slings with love, care and respect. Oscha stylish woven wraps, ring slings and baby carriers are perfect from birth through to toddlerhood & beyond. Want to find the right baby sling for you? Visit our Getting Started page to help you take the first step on your carrying journey.